Archive for "Oklahoma City Memorial"
Oklahoma City has been on my route to/from Indiana as I traveled to both the Phoenix area and Southern California over the last 10 years. 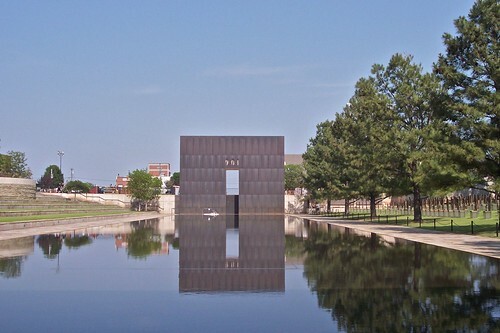 However, I’d never taken time to visit the Oklahoma City National Memorial until May, 2011. No one can forget the bombing on April 19, 1995, of the Murrah Federal Building which killed 168 people. That event was the most serious terrorist attack in the United States prior to September 11, 2001, and it shocked the nation. When I read about the international competition (624 entries) for the design of the memorial, I realized how this event had touched the hearts and minds of people all over the world. The Oklahoma City bombing is now dwarfed by the huge death toll from attacks on September 11, 2001. But anyone who visits the Oklahoma City National Memorial will be touched by the simplicity and symbolism of the design. For more information on the Oklahoma City National Memorial, visit (http://www.oklahomacitynationalmemorial.org/secondary.php?section=2&catid=30). To view a slideshow of the memorial, click on any photo. If info about the photos is not displayed in the slideshow, click Show Info. The photos below and in the slideshow were taken by my sister Mary Hunt and me. The East Gate, one of the two Gates of Time, is engraved with 9:01 representing the demise of the innocence of this Heartland city. Its image is captured in the Reflection Pool in this excellent photo by Mary Hunt. 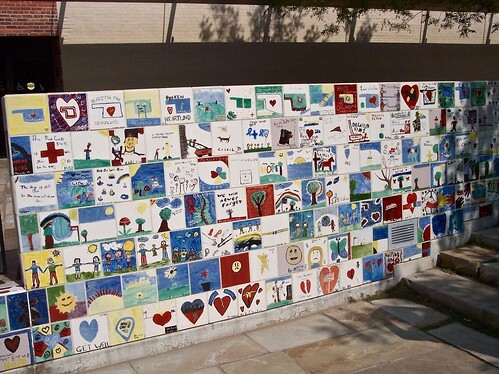 Messages of hope, particularly for the rescue workers, were painted on ceramic tiles (now on a wall) and sent to the city where they are as part of the memorial. The Field of Empty Chairs represents the 168 people who died in the bombing. 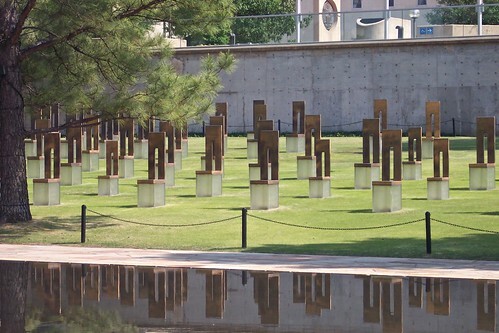 According to Oklahoma City National Memorial’s website, 19 of the chairs are smaller, signifying the children who died there. I regret that I did not notice this significant difference.